Jorge Soler (OF/DH, KC), who has been out of action since mid-June with a fractured left toe, started doing some baserunning drills over the weekend, and is expected to begin a rehab assignment at some point this week. 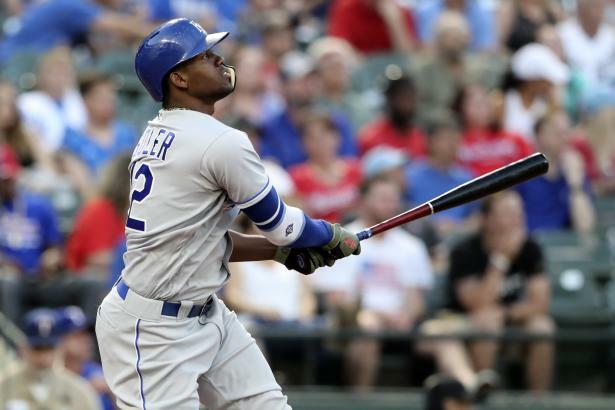 Royals' manager Ned Yost also suggested that Soler will likely be limited to DH duties when he comes off the DL, in an effort to keep him healthy for 2019: "Will he probably come back and play the outfield? Nah. We'll probably DH him and get him some at-bats and make sure he's ready to go spring training. He's functioning now with no pain so it's a good thing to get him some at-bats to get his timing back." That insight from Yost gives us a better idea of how playing time might shake out after Soler's return. Lucas Duda (1B/DH, KC) and Ryan O'Hearn (1B/DH, KC) have been alternating at 1B and DH lately, which would seem to lead to an easy decision for the Royals. The 32-year-old Duda is a free agent at season's end, is hitting just .242 with a .726 OPS, and currently has the second-lowest xBA (.230) of his career. He has cleared waivers, and certainly Kansas City would love to trade him before August 31, but even if they don't, there's no reason to keep playing him at this point. O'Hearn, on the other hand, is a 25-year-old rookie whose small-sample .899 OPS over 62 AB is currently best on the entire team. He's hit 6 HR in those 62 AB, with his power backed by a 155 xPX, 114 HctX, and 41% fly ball rate, though his 215 PX and 35% hr/f are unsustainable. The lefty is only 1-for-20 (.050 BA) against LHP so far, and could perhaps use the occasional day off against them, but other than that, there's no reason he shouldn't get the nod over Duda. Another option to add to the mix could be 26-year-old Frank Schwindel (1B, KC), who has followed up a stellar 2017 season (.329/.349/.541 with 43 doubles and 23 HR over 529 AB at AA/AAA) with a strong performance in his first full season at Triple-A: .285/.337/.507 with 34 doubles and 23 HR over 473 AB, including a .971 OPS in August. He would need to be added to the 40-man roster to earn a September call-up, but at the very least, could make for a natural platoon partner with O'Hearn. Two other potential September call-ups might be 24-year-old Josh Staumont (RHP, KC) and 23-year-old Richard Lovelady (LHP, KC), both of whom could slot into the Royals' bullpen. Staumont, armed with a fastball that can hit triple digits, remains one of Kansas City's best pitching prospects, though moving from starting to relieving this season has not improved his control (6.4) or command (1.9). Lovelady posted a 2.36 ERA, 8.5 Dom, and 3.4 Cmd over 68 IP in his first season at AAA-Omaha. Neither player is currently on the 40-man roster. If you've been reading this column on a regular basis this season, you're likely aware of how often we've suggested Lucas Giolito (RHP, CHW) and his horrible skills were not long for the Chicago rotation. Not only has Giolito proven us wrong by sticking around all year, it's now looking like he might finally be turning a corner in August: 4.35 ERA, 2.9 Ctl, 9.3 Dom, 3.2 Cmd, 60% FpK, 11% SwK, 3.37 xERA, 122 BPV over five starts. He seems to have done so by relying less on his four-seam fastball (27.0% usage in August, compared to 43.4% on the season) and more on his change-up (23.4% usage in August, compared to 15.0% on the year). His change-up is one of his best strikeout pitches, earning a 16.5% whiff rate on the year, and 20.7% in August. He might be ready to emerge as a prime post-hype sleeper in 2019. In a case of skills eventually winning out, Jace Fry (LHP, CHW) appears to have moved into or close to the lead for saves consideration, picking up his second August save over the weekend. The struck-by-lightning rare combination of a 37% hit rate, 0%(!) strand rate, and 25% hr/f led him to an 11.88 ERA in July, but his skills have been better than ever in August: 2.16 ERA, 3.2 Ctl, 18.4 Dom, 5.7 Cmd, 17% SwK, 1.69 xERA, 264 BPV, with his highest average fastball velocity yet (94.1 mph). There's a growing chance that he could be in the mix for the closer role in 2019 and beyond. With the promotion of Michael Kopech, the White Sox might not have any impact call-ups in September. It's beginning to look more and more like Eloy Jimenez (RF, CHW) will be held back to avoid accruing service time; he's clearly ready (.364/.407/.620 over 184 AB at AAA-Charlotte), and the team has passed up recent opportunities to give him a roster spot with injuries to Jose Abreu and Leury Garcia. Certainly it's still possible he'll get called up, but when GM Rick Hahn was asked about Jimenez after Kopech's call-up, his response wasn't encouraging: "He’s going to remain in [Class AAA] Charlotte at this time and continue on the path that he’s on, and we’ll certainly continue to evaluate where he’s at in the coming weeks. And when the time comes, we’ll explain the logic behind whatever decision with regards to the rest of his 2018 season as well." Charlie Tilson (OF, CHW) will likely get another look, and even though his MLB performance this year has not been good (11 xPX, .226 xBA), with Leury Garcia possibly out for the remainder of the year with a hamstring injury, there should be AB available in CF for Tilson. And with a 128 Speed score and 14% SBO, he could potentially contribute a couple steals down the stretch. There have been rumors that the Indians might still add a bat before the end of August, especially after losing Leonys Martin for the remainder of 2018, but if they do, it appears it won't likely be a third baseman, as last week, manager Terry Francona downplayed the possibility of Jose Ramirez moving to second base, even though Ramirez has done so in the past: "We've talked about everything, as we're supposed to. I know it sounds good on paper and it even sounds good to me on paper. There's other things you have to think about other than just numbers. So, that's probably why he's stayed where he is." Speaking of Martin, although he won't be playing again in 2018, he will have one more year of arbitration eligibility with the Indians in 2019. In the meantime, his replacement, Greg Allen (CF, CLE), has been playing much better over the last 31 days, batting .348/.386/.424 with 7 SB in 66 AB, along with an 89% contact rate, 128 HctX, and a .278 xBA. He could be a valuable source of steals down the stretch. And with Martin and Allen returning in 2019 along with Tyler Naquin and Bradley Zimmer (and three of them left-handers), you have to wonder if Cleveland will choose not to re-sign impending free agent Michael Brantley. Brantley is enjoying his best season since 2015, but he'll also be 32 next year, and was only on the field for 101 games in 2016-17. The Indians aren't likely to have much playing time available for September call-ups, but one name that has been getting a lot of mentions is Eric Haase (C, CLE), as teams typically like to have a third catcher on hand down the stretch to give their regulars a few more days off. Haase has good power (26 HR in 333 AB at AA-Akron in 2017, 18 HR in 420 AB at AAA-Columbus in 2018), but can be contact-and-BA-challenged, as he's hitting just .229 with a 67% contact rate at Triple-A this year. But given that Roberto Perez (C, CLE) has turned in a career-worst .472 OPS and .169 xBA this year, the Indians might like to get a look at Haase with an eye toward 2019. The Tigers activated JaCoby Jones off of the DL on Monday, and he'll return to his regular spot in CF. It appears that will send Victor Reyes (OF, DET) back to a part-time role. Even increased playing time hasn't done much for Reyes's skills—he had a .485 OPS in the first half, and is at .495 so far in the second half, with worse marks in xBA (down from .265 to .233) and BPV (down from -7 to -22). It has been clear for most of the season that the Rule 5 pick simply isn't ready for the majors, though he should still get a decent amount of AB down the stretch filling in at all three OF positions. Mikie Mahtook (OF, DET) may have earned himself a longer look thanks to 4 HR in August following his mid-month call-up. He's hitting .237 with a .948 OPS in 38 AB in August, though a 69 HctX and 97 xPX cast some doubt on the legitimacy of his power streak. His overall power skills (69 HctX, 46 xPX) are still a far cry from what they were in 2017 (119 HctX, 112 xPX), but at 28, he probably still deserves a chance to see what he can do in September. For a team that's out of contention and has some potential openings, unfortunately most of Detroit's top prospects aren't close to major league ready. We've mentioned Christin Stewart (LF/DH, DET) several times this year, and he's still a possibility, though he'll need to be added to the 40-man roster. Another possibility could be Spencer Turnbull (RHP, DET), who turns 26 in September and was just promoted to Triple-A. Turnbull was a second round pick back in 2014, and is already on the 40-man roster. He's not a top prospect, but did post a 9.6 Dom, 3.7 Ctl, and 2.6 Cmd over 19 Double-A starts this year, with a 4.47 ERA that was inflated by a 34% hit rate and 65% strand rate. And in his Triple-A debut on Monday, he struck out 11 batters over 6 IP with just two walks. The Tigers don't currently have a starter lined up for September 1—could Turnbull get a shot? Since his July 30 trade from the Yankees and call-up from Triple-A on August 10th, Tyler Austin (1B/DH, MIN) has been doing everything he can to make himself a bigger part of the Twins' plan for the remainder of 2018 and into 2019. It's only a 42 AB sample so far, but as a Twin, he's hitting .333 with a 1.155 OPS, 112 HctX, 141 xPX, and .322 xBA, and a 71% contact rate that's higher than his career 59% rate at the major league level. He's also hit 3 of his 6 HR against RHP, along with a .310 BA in 29 AB. The Twins have already called up a lot of young prospects in August, but there are a few players left who might surface in September. With the news on Tuesday that injuries for Michael Pineda (knee) and Adalberto Mejia (elbow nerve) will end their seasons, Stephen Gonsalves (LHP, MIN) and Kohl Stewart (RHP, MIN) appear to have a shot at sticking in the rotation for the remainder of 2018, or until they hit an innings limit. Fernando Romero (RHP, MIN) might get another look as well, though he's already thrown 142.2 IP between Triple-A and the majors after throwing 125 IP in 2017, so it's possible he will either be shut down or move to the bullpen in September. Byron Buxton (CF, MIN) might finally make his way back to Minnesota, though the Twins have been rather tight-lipped about it. Buxton returned to the Triple-A lineup from a wrist injury on August 14th, and in the 9 games since then, he's looked quite good, batting .350/.381/.600 with 7 extra-base hits in 40 AB. Top prospect Nick Gordon (SS/2B, MIN) seems unlikely to get a call-up, as he's hit just .205/.255/.276 over 351 AB at AAA-Rochester, and has fallen to .171/.257/.195 since the All-Star break. He's also not on the 40-man roster. However, that doesn't mean he won't be a part of the Twins' plans for 2019, especially since the trade of Brian Dozier has left the team without a clear favorite to play 2B next season.